Well. It’s been 10 months now I’ve been using Maxis Broadband since I first got it. Well, it’s not something to be talked off (you can just read various raged rants at that entry), but hey, I’m using it as my secondary internet whenever I’m on go. Well, this is the day that I decided that I want to terminate this. Reading from terms and condition, I have to bring back the modem to the Maxis center for account termination. Well here you go. The modem is put back nicely into its original packaging. 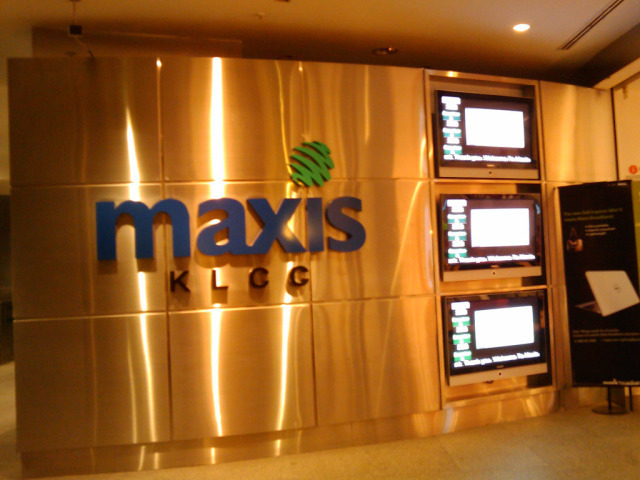 Went to Maxis KLCC for that process. I guess not much people came here for Maxis Broadband purposes. I just go straight to counter 17 without having to take the queue number. There no more 18 months contract, and it costs RM200 if terminated before 12 months period (from T&C). But the person that handles me suggest something else. He suggested that my account to be suspended, and during this time, the bill will be RM0. So in January 2009, I just need to come here again, and terminate my account, and RM200 will be waived (since I use it for more 12 months). That sounds like a good idea. But account suspension can only be done for maximum of 3 months, where legal action will follow after that is the account is still suspended. So I guess this will be a trick. If you have used your Maxis Broadband for 3 months already, and you want to terminate it, to save the that RM200 fee, just suspend the account, and terminate the account only after 12 months period. A word of advice. 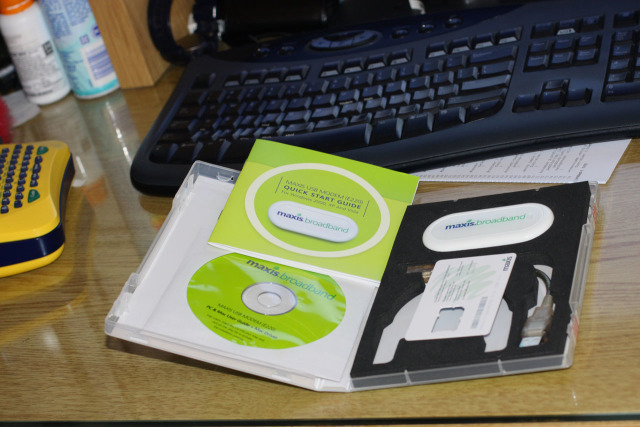 Make sure you bring along the original packaging that you received, especially the short and long USB cables supplied. I forgot to bring my long USB cable, and the agent said that RM30 will be charged for that. Luckily it’s not today that I’m terminating my account. Anyhow, does that mean that I no longer have my secondary internet, where I can go online whenever I’m on move. Well, no really actually. I opt in for the Internet2Go Unlimited Package for my Maxis Postpaid’s Value Added Services. 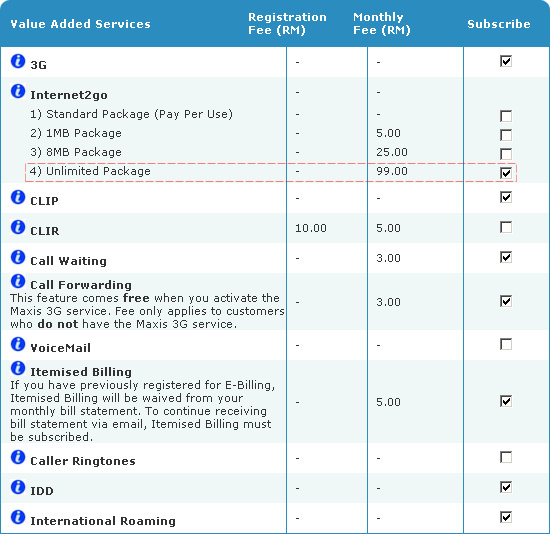 RM99 per month only compared to RM138 per month previously when using Maxis Broadband. One might think it’s a waste though for a phone to have that. 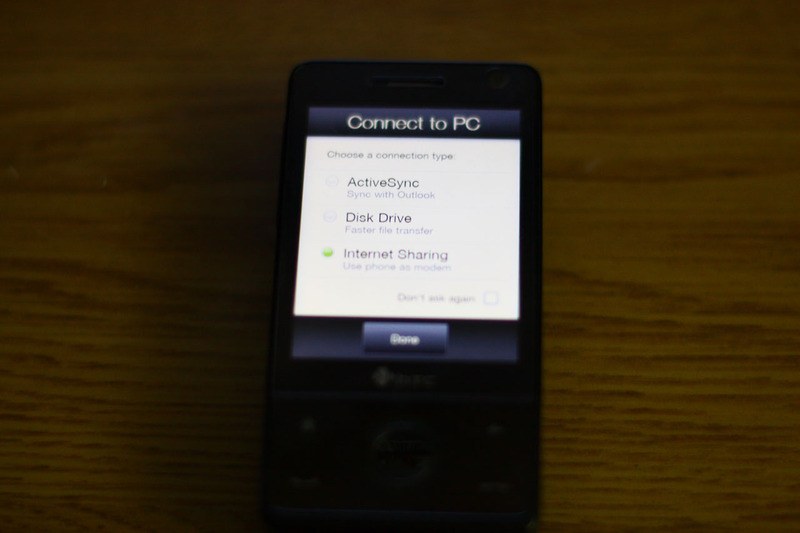 But actually, my HTC Touch Pro itself is like a mini computer running Windows Mobile. There’s plenty of applications that needs data connection. I can browse using Opera Mini, which it really show the web that way you see it on PC, there Windows Live messenger, I can use IM+ software to talk to my friends on Yahoo, Google Talk, AIM, I can instal Skype. It really fun to use Google Map here since HTC Touch Pro has internet GPS receiver, and Google Maps application also requires data connection. And there’s other plenty of software that rely on internet connection. Also, my HTC Touch Pro can also be used as modem, pretty much the same concept as when using Maxis Broadband USB modem before. I just plug the USB cable, and this screen is shown. I just need to choose Internet Sharing. Then I go to Start -> Programs -> Internet Sharing. Yeap. 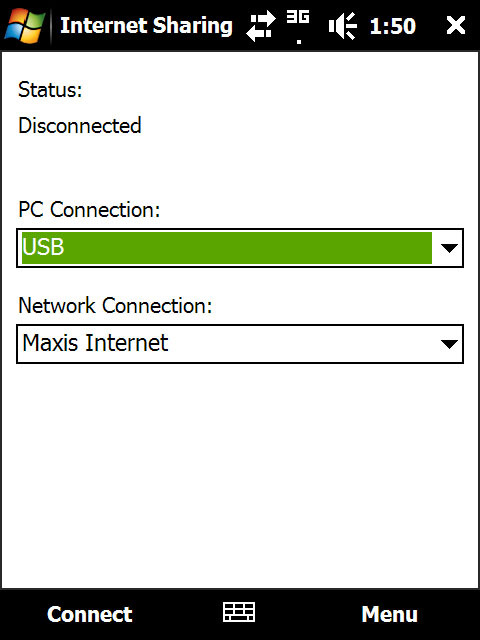 I’m connected to PC / laptop using USB cable, and I want to connect to internet using Maxis Internet. Finally, I click connect. And walla! I can access internet on my PC / laptop using Maxis 3G connection. And it’s the same before. If I’m in the HSPDA area, then I’ll get high speed browsing, and I’m out from 3G coveraga area, I will be browsing using either EDGE or GPRS. I just want to get the best of what technology can offer. eh? where is that Bulgaria post??? meaning htc pro modem dia acts sejibik macam maxis broadband ke? that easy? plug in and tadaaa.. can use oredy? Sorry to intrude, but I stumbled upon your blog upon searching for Maxis 3G settings on Google for HTC Touch Pro. Must I say your blog is very informative for someone like me. Haha. I see that we’re using the same kind of phone but it looks like the 3G settings are working well with yours. I didn’t have any problems with the 3G configurations until I upgraded my SIM card to a Maxis 3G SIM. The question that I would like to ask you is, how do you set the 3G settings, may I know? I tried to use the same settings so many times but failed miserably. Help? Actually, I formatted my TP once I got it from the shop. The shop installed too much junks (which I don’t need) and one of the program keeps giving an error to my phone. So I decided to format. After I format, and once I put in my SIM card, the auto setting wizard started, which also set the Maxis 3G setting. And it works ever since. 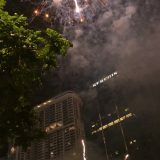 Maybe this weekend I will try to make the screen capture of the 3G setting, so that you can set the same on your phone. Thanks a million for this. Greatly appreciated. Gonna call them shortly. How to use Broadband sim card with ur phone? 1. Put broadband sim card into ur 3g hp..
2.Go to hp setting, set the APN (unet for maxis.celcom3g for Celcom)..
3.browse internet using ur hp application..
hi there. the way on how to use phone as a modem varies from model to model. if it's nokia, then you need to install PC Suite. 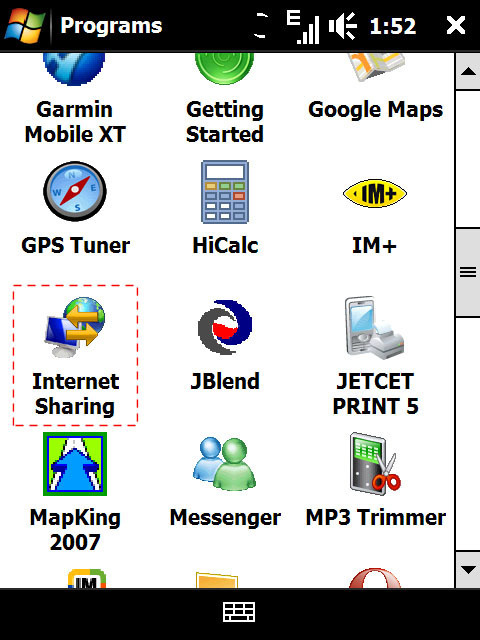 I'm using windows mobile, and it has this internet sharing option. it will use the same setting as what you phone is using to send/'receive MMS. usually, you can get that setting from maxis website, but latest phone nowadays can detect what telco you are using and set all the 3G connection automatically. hi i have a decision to made. Can i still terminate my broadband if i've been using it for 4 months. But now I haven't been using it. I live in perak, does this means i need to refer to maxis center in kl or somewhere nearby? hi imran. Thanks for the post. I would like to ask u bout the suspension. Do u request to maxis to make the suspension? Or is it that u just leave ur account over limit n they will suspend ur account? so after the suspension thaere will be no cost to pay? Hi Fatin. Last time actually the customer service guy suggested that I suspend my account to avoid penalty for early termination, and he did it for me. Not sure if this is still valid nowadays. Previous story Flying to Bulgaria again?